The Lake Garda Italy, lies in the western side of the region Veneto: the biggest Italian lake is a jewel set between the Dolomites mountains, the Po valley and scenic hills dotted with vineyards, lemon trees and olive groves. It is not by accident that the east coast is called Rivera degli Ulivi. The lake is located among three Italian regions: Veneto, Lombardy and northward the mountaneous Trentino-Alto Adige, where at times the spectacular steep cliffs remind of the North European fjords. 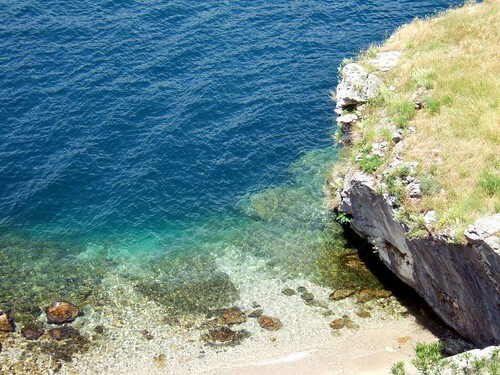 Located a stone’s throw from Verona, the lake boasts alluring clear water thanks also to its slow water turnover. You can feasts your eyes on stony beaches, on rocky cliffs that sometimes fall sheer into the turquoise lake. Enjoy the view of inlets and blue bays and stroll around picturesque villages overlooking the lake, often crowned by medieval castles or ancient strongholds. The lake measures 368 sqKm/229sqmi, has a perimeter of 162Km/100mi, it’s 52Km/32mi long and has a maximum width of 17,5Km/10mi. There are several spots along its shores from which you cannot see the land on the other side: only an endless expanse of water, just like at the sea. The beauty of the natural setting, its strategic location and mild climate all year round enticed over the centuries travelers from all of Europe, such as Lord Byron, the German writer Goethe, Proust, Klimt, D’Annunzio and others. Way before, Romans conquered the lake in 225 BC, after defeating Gauls. In the Lake Garda you’ll see the great heritage left by Romans, that chose the lake as a holiday spot, building big villas and thermal baths. In the far south of the lake, in the penunsula of Sirmione, stand the Grotte di Catullo, interesting remains of the Roman era. In the fifteenth century the lake of Garda and its hinterland became part of the Republic of Venice. The Lake of Garda is the ideal place for people who want to spend a getaway in a romantic place full of picturesque and tranquil villages, rich in history and culture, and/or wishing a wine and food experience. The surrounding areas instead are good for families and children and for anybody looking for fun. If you are looking for peace and tranquillity, you can merely relax yourself strolling around one of its villages, enjoying their bright Mediterranean flavor, or going for a walk by the lakeside. For history lovers, there are plenty of opportunities: for instance you could take a trip to the peninsula of Sirmione in the south, to visit the Grotte di Catullo (Catullo’s caves) dating back to the Roman era. It's about the biggest Roman villa remains left in northern Italy. You’ll be spoilt for choice: archaeological excavations, medieval rural churches, elegant 1700’s and Liberty-style villas, castles and well preserved colorful villages. On the Lombard side, in Gardone, you can visit the Vittoriale, the big and lavish mansion of Gabriele D’Annunzio, a poet, writer, soldier and politician well known during the Fascism, and friend with Mussolini. The villa, beside being surrounded by a magnificent park, hosts inside an interesting museum displaying objects, war relics and furnitures – often weird and pretty kitsch – belonged to D’Annunzio. During the day, you can relax at the beach while sunbathing and swimming. For the sports lovers, there’s a wide range of leisures available as well: windsurfing or renting a boat are one of them (there are also courses availble for the beginners). The lake is usually windy, especially in the northern side, making it an authentic paradise for winsurfers and sailing boats: there are about 40 different winds in the area blowing all day long both from the lake and the shore. Many other sports can be practiced, like hiking, climbing, horseback riding, mountain biking, para-gliding, hang-gliding, golf, you name it! Enjoy the excellent cuisine of the area, sitting on the terrace of a trattoria facing the lake, admiring one of the most romantic scenery you can imagine. Or you could take a trip toward the surrounding hills following one of the scenic wine routes for a wine tasting experience, stopping at one of the many wine estates open to visitors. Do not forget that Amarone wine , i.e. one of the most prestigious Italian wines, is made in the nearby Valpolicella area. Not to speak about Bardolino, another great Veneto wine. More here about the scenic Bardolino wine route. For people who love amusement and crowd, and of course for children, the hinterland provides are a series of theme parks, plus discos, clubs and all things for the fun lovers. The big theme park of Gardaland, located in Castelnuovo del Garda (province of Verona) is considered the Italian Disneyland and it is one of the most popular theme parks of Europe. A chance to go back to childhood dipping into a real dreamworld made of fancy and adventure where both children and adults will have a lot of fun. Not far from there, in Lazise, there is Caneva World, another theme park offering 4 different themes: Aqua Paradise, Medieval Times, Rockstar Café and Movie Studios. A few miles away in the hinterland, in Bussolengo, you can dip into nature in the Parco Natura Viva, hosting about a thousand freely mooving animals from every continent. In the Safari Park you can observe from your car a lot of savanna animals. I still remember as a child back in the day being there for a day trip, and a friendly giraffe approached us sticking its head inside our car. Amazing! Another great day trip is the romantic Park Sigurtà, hosting thousands of trees and plants (many of them centuries old), considered among the five most beautiful gardens in the world. Want more tips and practical suggestions for your lake Garda vacation? Have a look at this interesting site offering personalized holidays in lake Garda Italy. The quaint medieval small town of Malcesine is one of the most renowned and suggesting villages of the Garda lake, overlooked by a majestic castle. It is set between the blue of the lake and the green of the steep Mount Baldo (beloved by hikers) that falls sheer into the water. A place blessed with constant winds, perfect for windsurfers as well. During your Garda lake holidays do not miss the pictoresque Torri del Benaco, whose origin date back to the Roman era, overlooked by the most imposing castle of the Lake Garda Italy. Another of the lake Garda towns is the homonymous Garda, one of the most popular destination of the lake Garda Italy. It boasts fine palaces and the most suggesting and magic bay of all the lake, celebrated over the centuries by artists and celebrities: Punta San Vigilio.